Well I knew it was going to happen eventually, being here for a year. I’ve avoided it for 2 months now, but no longer!! Je suis malade en Paris!! I’m sick in Paris! It started after a crazy weekend where all of a sudden my throat started hurting Sunday evening. The next morning, I was dying. Pulled out the handy small flashlight my mom got for me and… AHHHHHHHHHHHH!!!!!!!!!! Frantic texts to several friends, and lots of internet searches later and I was absolutely convinced that I had tonsillitis. There was some Google image search compared with my throat going on. ughh. According to the internet, I wouldn’t be better for 7-10 days?!?! I needed a confirmation from a doctor but being new in Paris I had no clue where to go. It wasn’t serious enough to go to the hospital, and I didn’t want to wait hours at a clinic. A friend suggested sos medecin and SAMU – two services for non-life threatening illnesses where they come visit you at your house. The next text was to my French friend just as a doublecheck, who pulled a list of general practioners near me. yess!! A couple hours later and a friend helped me call a couple and I had an appointment for the next day- check! 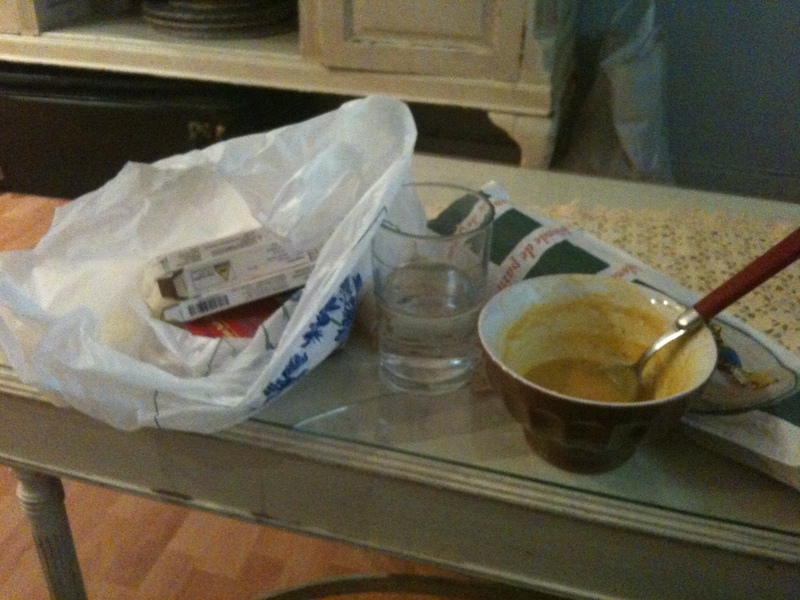 The next morning my throat was worse…. aghhhhhhhhhh.. I made the decision to skip class. I just wasn’t in the mood for making a pear cake at 8:30 in the morning. Slept till noon. Then my friend met me to go with me to the doctor’s office. Doctor’s offices are actually in apartments here. You wouldn’t even notice the little plaque on the wall announcing their name walking down the street. Hence why I had such problems finding them! Followed the signs up a flight of stairs, and all of a sudden we were in an apartment converted into a doctor’s office. Apparently there’s no waiting at the front desk (which we learned after a couple of minutes). Just a quick walk through to the waiting room to sit until the doctor comes by to call your name. The Doctor was incredibly nice!!! In his very spacious used to be a bedroom or living room. haha I had my one French phrase down pat- “J’ai mal a la gorge!” My throat hurts! Said with a big smile. uh oh. Lots of French questions from the doc – a glance at my friend. 😀 Translating! The doctor actually knew some English so it was a funny mix of him talking to Jenni in French or me in English. Super quick exam because well it was obvious what I had. There might have been a gasp from the Doctor when he saw my throat. hahaha Yup- a serious cause of Tonsillitis. Recovery time… 2 days. To which I might have thrown my arms in the air and said yay!!!!!! Three prescriptions!! Two for very strong antibiotics, the other an Advil throat spray. c’est cool!!! The total for the visit 45 euros, paid in his office! Not bad, not bad. Grand total on my meds… 31 euros. Adds up but I’m just happy to be better in 2 days! I’ll be running it past the expat health insurance I have here through HCCMIS. Final verdict– awesome! Super easy, very friendly doctor, not very expensive, and on time! Paris, why do I get so lucky with things while I’m here? There just haven’t been any major headaches! hmm I wonder if that means there’s something brutal planned for later? hahaha I guess I’ll just be content being loopy on antibiotics and eating soup with a baguette until then or at least till I’m better.